Imagine lying in a hammock, swaying softly in the wind, listening to the placid gurgle of water tumbling over itself in your backyard. It’s a nice image, but one most people feel is out of reach if they’re not lucky enough to have a babbling brook running through their property. Not so! 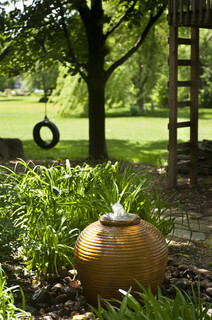 A backyard water feature can be just the thing to help you relax. The landscape designers at Havenscapes call the sound of a water feature the gateway to “a more Zen place,” and they couldn’t be more correct. The sound of moving water, from streams to ocean waves, has long been a sleep and relaxation aid. CDs, white noise machines, and whole playlists on streaming music services have been dedicated to the sound of running water, in an attempt to mitigate the stress of our overwhelmingly urban lives. How can we get the benefits of a water feature in our outdoor living spaces? 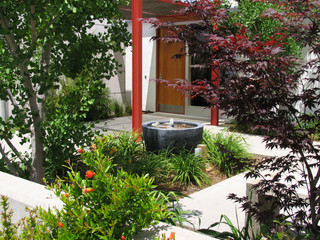 The simplest way is a self-contained fountain or patio pond. These water features recycle their water from the bottom pool to the top again, and only need to be topped off as water evaporates in the heat. Look for a fountain or pool made of cast resin if you’re looking for a lightweight option or of concrete if you’re looking for something exceptionally durable. Most fountains are equipped with energy-efficient pumps, and some are available in solar-powered models. Patio fountains range in form from the whimsical to the realistic, and can be bought fully installed, or can be undertaken as a DIY project.